The airplane on the way to Japan was virtually empty. When was the last time I was on an empty plane? Where are all the people? Don’t people go to Japan anymore? We’re in Tokyo. We arrived yesterday around 5pm. 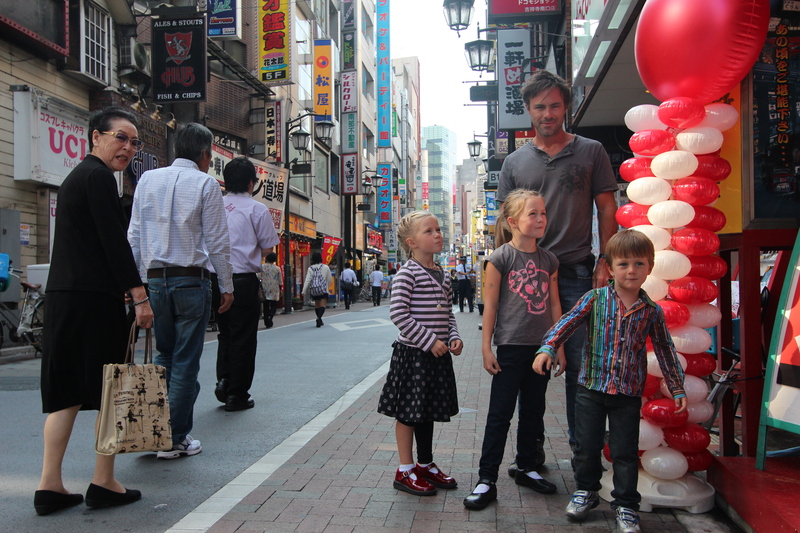 I think this is a great time to be in Tokyo as there are few tourists…. as long as we don’t grow any extra limbs. We definitely don’t feel any radiation, so it must be ok. It was very exciting to open our tokyo suitcase. Fresh clothes!!!! Three weeks with virtually no clean clothes. Landromats are hard to come by in Polynesia, and when we did drop some off, we got them back with RED splotchy paint on all the whites. Thanks for that!! The weather is great in Tokyo. Everyone is well dressed and so it was manditory that we all clean ourselves up and wash away a bit of vagabond. Felt good to put back on the uniform…jeans, boots, and clean shirt. Tokyo here we come. We’ve rented a little flat in a cool residential neighbourhood in Tokyo, near Nishi-Ogikubo Station, two bedrooms and a pull out couch for Ash in the living room. We met the owner at the train station. 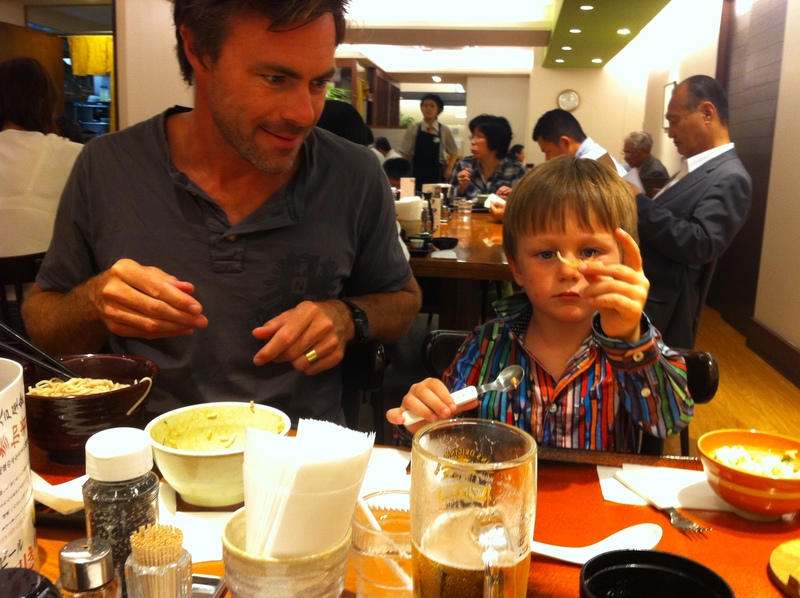 Clearly he thought we had no idea what we were doing ….and we don’t. Even though I have been here four times and even lived here for a bit, everything is tinged with mystery. Fortunately everyone around us thinks we are useless and so they have low expectations. 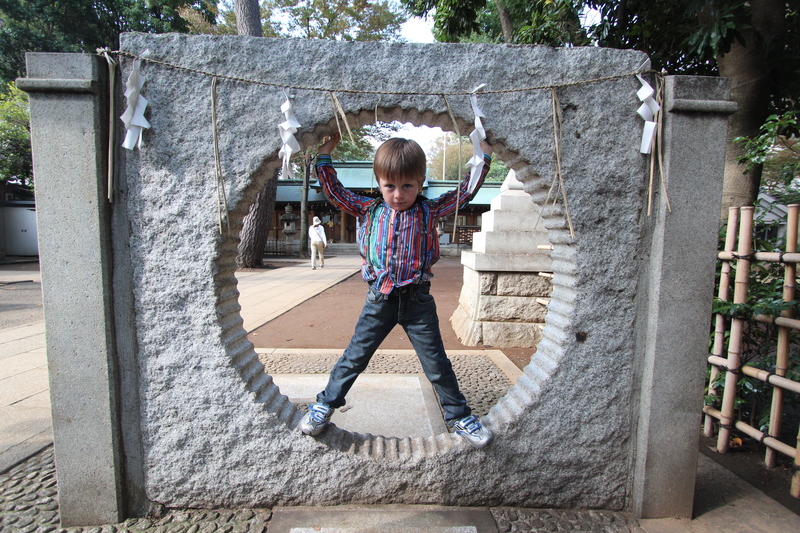 We crushed Tokyo today though IMHO: walked to an animation museum, killer lunch, a park and a zoo. 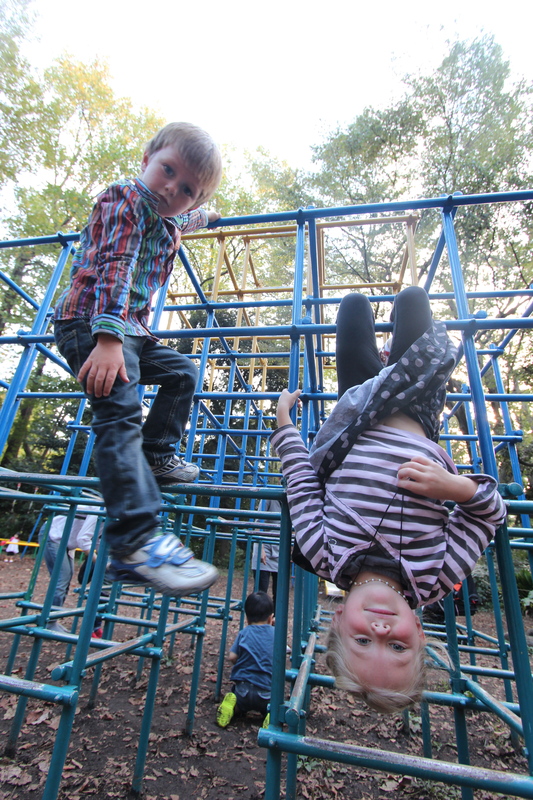 It doesn’t sound like much, but with kids the pace can be a wee bit slower. I love this city. We are so lucky to have such great Japanese food in Vancouver! The kids are happily slurping up their soba noodles and prawn heads. deliscious! 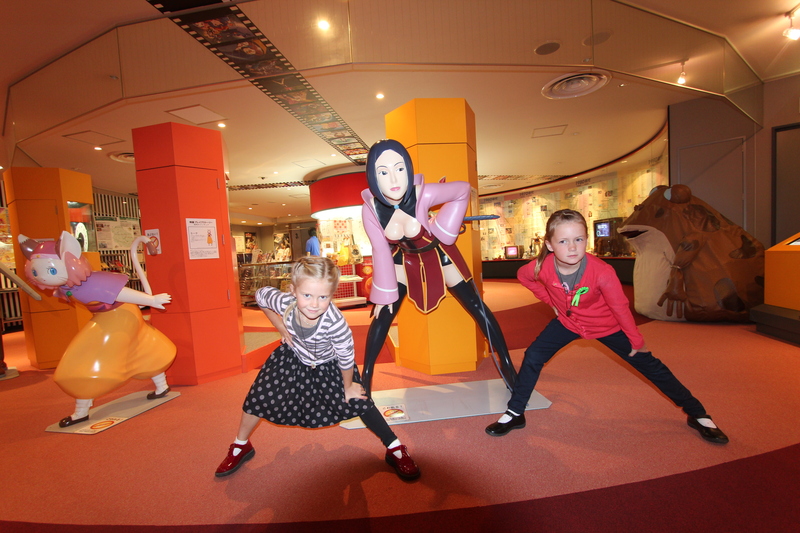 We went to an Anime Museum. Even though there was limited english, it was amazing. Gwen and Kate really didn’t want to leave, and left chanting, “we’re gonna make a movie”. Release pending! 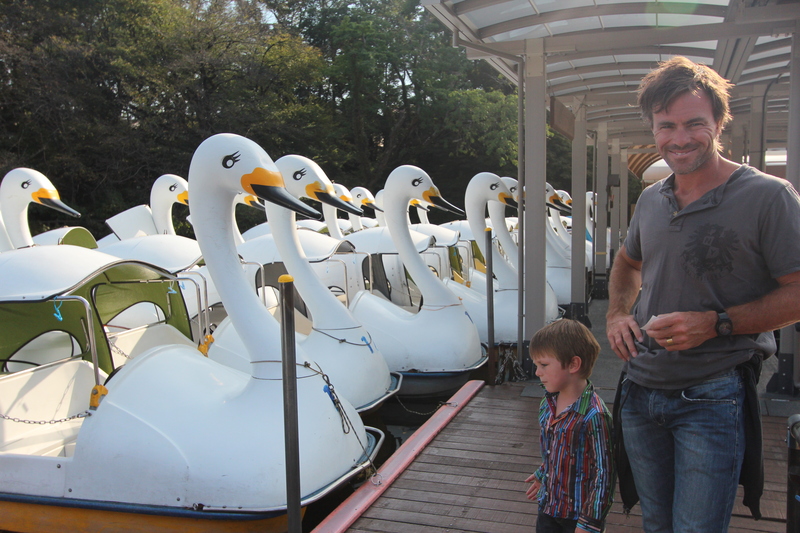 How can you resist a swan boat? I think we need to rethink the paddleboat at the cottage? It is so amazing to be reading about your odyssey! Your photos are breathtaking and we are enjoying every written word. The fins on that yellow-fin tuna look like blown glass! I love those photos of the tree house in Tahiti! It looks like it is from a movie set. Too cool to be real!